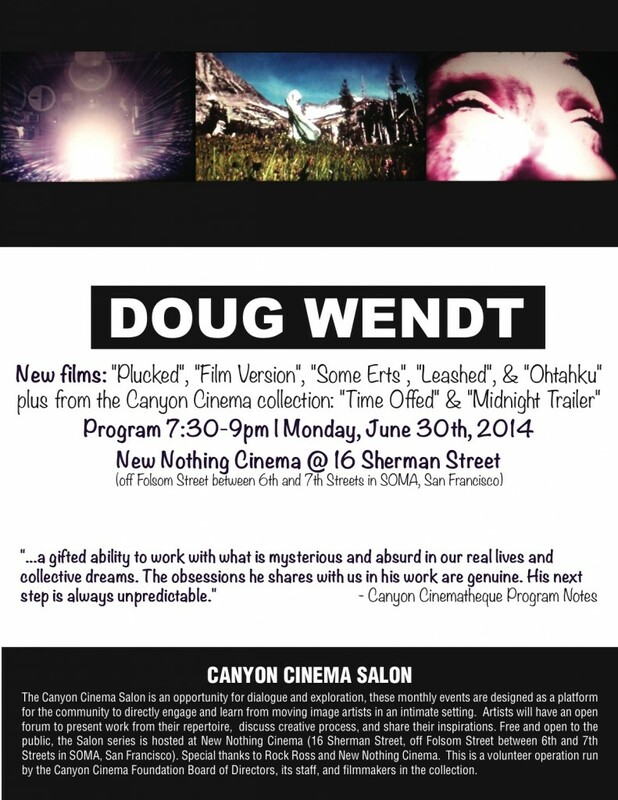 Join us Monday, June 30th at New Nothing Cinema for an evening with filmmaker and visual artist, Doug Wendt. Wendt, once coined “one of the most original and zany minds in underground film”, will be presenting some old favorites along with several previously unseen and unreleased works. Given Mr. Wendt’s comedic finesse, this event is certainly not to be missed! And did we mention that it’s FREE? Audio visual artist Doug Wendt has been making films and been active in the radio/music business since hosting Focus Collage on Montana radio in the 1960s. Doug received a Masters Degree in Filmmaking from the San Francisco Art Institute in 1972. His award-winning films have been seen in museums and on SNL. Wendt served as President, Board Member, Film Inspector, and Projectionist at Canyon Cinema in the 1970s while managing the Presidio Theatre’s Midnight Movies underground film series. He’s provided assistance for many films including several on Bob Marley, worked as Music Consultant for the 1997 Oscar nominated documentary MANDELA: SON OF AFRICA, FATHER OF A NATION and for an Art in China film as well as Paramount Picture’s 48 HRS with Eddie Murphy in the 1980s. His revealing interview with Peter Tosh is featured through out Peter’s STEPPING RAZOR RED X film. Wendt’s popular worldbeat VJ dance party, originally presented from 1988-1994 at The Kennel Club in San Francisco, featured hours of custom edited videos compiled by Doug projected onto three large screens. DETAILS MAGAZINE called the unique events “Best Night Out In America” while O GLOBO in Brazil hailed the weekly five hour ever-changing musical trip around the world “An Empire of the Senses”. Doug’s Midnight Dread, World Beat, Deep Sixties, and Native Son Rising radio shows/selections have aired on KFOG, KQAK (The Quake), KQED-TV, KPFA, and KUSF in the bay area plus WXPN and KGPR etc. They currently broadcast daily via World One keCg out of El Cerrito CA and stream on the web along with Doug’s new Reggae MD full time internet radio station for radioIO.com which debuted March 3rd, 2014. Doug moved home to Montana from SF in the mid-90s where he finished several new 16mm films being screened to the general public for the first time anywhere tonight. He’s run the local NPR affiliate and taught film classes at two nearby universities. Wendt also started the live music group and radio program, Ghost Town Sound. One of his band’s signature videos closes this evening’s selections.